the wind beat up our garden and went hiking with our friend, Michael Wester. Michael’s family owns an in-holding in the Cibola National Forest, east of the Manzano Mountains, which are south and east of Albuquerque. The drive is fairly long but, once you leave Albuquerque, it’s through pretty countryside. Well, “pretty” if your idea of pretty includes pastures dotted with scrub juniper, occupied by the occasional cow or horse, with lots of empty spaces in between. Fortunately, mine does. In addition to cows and horses, we also saw a fair number of ravens, but the hawks seemed to be on holiday. So were most of the smaller birds. We passed through a few small towns with interesting sounding names: Tijeras, Escobosa, Torreon, and Manzano. My favorites were Chilili and Tajique, both of which have their roots in Pueblo Indian languages. Many of these “towns” didn’t consist of much more than an old, Spanish-style church (usually without a resident priest, but with a well-tended cemetery), a general store (sometimes with a gas pump), and a cluster of old houses and battered trailers. And dogs. We passed through several towns without seeing a single person, but I always saw at least one dog, usually middle-sized and brown. After a while, I began to entertain the fantasy that there were no people in these towns, just the dogs. Eventually, we turned off the paved road onto a well-maintained dirt road. At this slower pace, we could better appreciate the wild flowers on the roadside, splashes of pink and white with a little yellow thrown in. Recent rains meant the area was fairly green – that is, “green” by New Mexico standards. Most folks would still find it rather brown. Anyhow, progressing down roads of gradually diminishing width, we ended up on Michael’s family land. This is at a higher elevation than Albuquerque, so the dominant trees were Ponderosa pines and some of the taller varieties of junipers, including the alligator juniper pictured on this page. 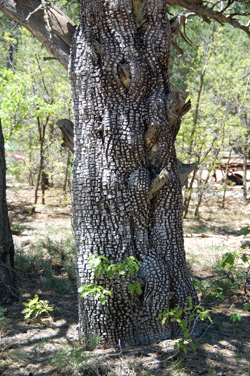 I particularly liked the alligator junipers, not only for their unusual bark, but also for how the trunks often seemed to be braided, rather than just growing straight. There were other trees as well, clusters of scrub oak (you never seem to get just one), some impressive pion, and sundry varieties of pine and juniper. Unlike the forests I grew up with in southern Maryland, these forests have very little undergrowth. Even in uncleared areas, you could walk pretty freely, without threading along on paths. Despite being further south than Albuquerque, the higher elevation meant spring wasn’t as advanced. Other than some Indian paintbrush, mountain mahogany, and some daisy-like flowers, we didn’t see a lot blooming, but I could see where not too much later the area would be glorious with penstemon. Michael’s cousins, Wayne and Lorane, were wonderful hosts. We visited in a log cabin that Michael’s father (now nearly ninety) had helped build. Wayne is a carpenter and cabinet builder. He has done a wonderful job of maintaining the old cabin without robbing it of its character. (We also got to tour the work-in-progress house Wayne is building – from scratch, including cutting all the boards himself). Wayne and Michael guided us on several hikes. We saw a small herd of mule deer, squirrels, and lots of birds. One thing I found very exciting was all the bear sign, including a fresh print down at the edge of one of the small ponds on the property and a place where a bear had clawed a gate post. We also saw elk tracks. Despite an excellent lunch and lots of chocolate chip peanut butter cookies, eventually we ran out of steam and figured we’d better head back to Albuquerque. We did so, changing altitude and with it the sense of the season, moving from spring in the mountains to hot, windy summer in town. However, the more I mulled over Nicolas’ comment, the more I thought it merited a detailed reply – and a shared memory to show that I do understand what he meant. Back when my own fiction publications were few, I attended a science fiction convention at which artist Liz Danforth teased author Roger Zelazny about how, some years before at a different science fiction convention, her team had beaten his in a trivia game because Roger couldn’t remember the name of one of his own characters. For those of you who wonder, the character in question was Rosie from Jack of Shadows. Rosie goes through a pretty tough time in that book. She plays a really important role, so, frankly, I was shocked. How could Roger have forgotten her? Now here I am, many years later, author of twenty-one published novels and over sixty published short stories (and that doesn’t count the ones I’ve written and haven’t published). I’ve got to admit it. Especially in the case of secondary characters, yeah, I’ve probably forgotten a name or two. The character, no, but whether the name was Daisy or Rosie or Petunia, yeah… Probably. Does this mean I don’t care? Hardly. I love each and every one of those people, but the fact is that enough time has passed so I don’t remember every one of them by name. Does this mean I don’t like Ed and Nancy? That I don’t care? Hardly, but life goes on and names slip down behind others in the filing cabinet which is daily life. However, there’s another reason beyond just pure human forgetfulness that I sometimes forget when a book is coming out or exactly what some character’s sister’s name is. That reason is a strong, practical outgrowth of a rule that every writer – especially those who hope to someday be published – needs to remember. Yes. Forget it. Put it out of your mind. Start something else. But why? How? How could you possibly do that? Well, the reality is that publishing is a slow, slow business. If you sit and wait for a reply on the fate of your “child” before starting something new, it’s likely that you’re going to do a whole lot more waiting than writing. Most writers prefer to be writing (a process in which I include editing, polishing, and, to a limited extent, researching). Here’s an example from my own recent experience. In January, a writer friend called to ask me if I wanted to work on a project with him. I said, “Maybe, sure. Send details.” And my friend said, “I’ll have X [the editor in question] get in touch with your agent.” Here we are in mid-May. Have my agent or I heard anything? No. Does this surprise us? Double no. If I’d spent that time waiting, I would have spent five months doing nothing other than waiting. Instead, I did a lot of writing. And, honestly, much as I love them, my books aren’t my children. Children need constant care and reinforcement. Books don’t. They don’t care if you work on them or not. Children do. So, I don’t think it’s particularly cruel or unusual to forget that one of my books is about to be released. The book is done. It’s birthed and off to the world where it will transform with each reader who encounters it. My job as a writer is to move on – all the while hoping that, for those who encounter it, the story that was the focus of all my energy while I was writing it provokes thought, or inspiration, or even something as light as amusement to fill an idle hour. It’s Out! Five Odd Honors. I talk a little more about a few other things I’ve been noodling with, then a thought hits me. Does that seem impossible? That I could forget I have a book coming out? Don’t get me wrong. I am completely pleased with Five Odd Honors. It’s the third volume in the “Breaking the Wall” series, which began with Thirteen Orphans and continued with Nine Gates. Writing it took the better part of a year of my life. Editorial duties associated with it occupied a chunk of another year. But, the thing is, the minute I mailed the page proofs back to Tor – hang on while I check my notes – on November 11, 2009, the book was a finished project as far as my involvement is concerned. I have nothing to do with the cover art, marketing, publicity or any of the other elements that happen after. That’s up to Tor, the reviewers, and, most importantly of all, to the readers. Now, after not really thinking about the book for the last six months, it’s time to start thinking about it again. I have two book-related events this coming weekend here in New Mexico: one at Esther Bone Library, one at Page One Bookstore. 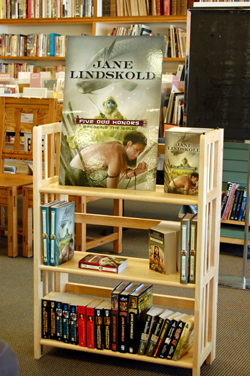 In June I’ll be signing in San Diego and Washington, D.C. (Details are available at my website, http://www.janelindskold.com, for those of you who might want to drop in). Five Odd Honorsis a darker book than the preceding two in the series, as events reach a culminating pitch. Brenda Morris has some tough decisions to make, including addressing the very serious question of where her deepest loyalties lie. Pearl Bright has some ghosts from her past manifest quite literally. The other Orphans find themselves going places most of them never even imagined existed. Don’t worry. I’m not going to provide spoilers. But, like I said, it’s time to start thinking about the book again. As I do… Well, all of a sudden, I’m really excited. How often do you get to see a baby elephant smile? Or have a long chat face to face with a pair of sassy lorikeets? Or hang out with a spider monkey while he finishes his lunch? Not often? Me either, but that’s just what Jim and I did a few days ago when we visited the Rio Grande Zoo here in Albuquerque. The weather was blustery, alternating between bright blue skies, lowering clouds, wind, and sometimes all three simultaneously. In other words, a typical late April day in northern New Mexico. We arrived shortly before noon and began our wander down by the lake and central green. Lunch groups were scattered on the fresh green lawns under the shelter of trees that had only partially leafed out. The prime season for flowering fruit trees was over, but a bright clump of blossoms still showed here and there. Elaborate bearded irises were shaking out their formalwear, taking over from daffodils and narcissi. After admiring the ducks and enormous carp that reside in and upon the waters of the lake, we strolled around to visit the seals and sea lions. These share a large enclosure that includes windows for viewing underwater activity, and a large comfortable deck above. Jim had brought his camera. While he stayed in the shadowed area below, trying for the perfect underwater shot, I went up. Three sea lions and a seal (harbor, I think) were sprawled in the warm sun. I agreed with their choice of activity and we spent some companionable time together. When Jim rejoined me (and had photographed the bathing beauties), we ambled around to the “Africa” section. We admired a pair of red river hogs in the last of the sun. The clouds came up again as we entered “Africa,” but this proved to be to our advantage since many of the animals were active. We got our best look ever at the pack of five African wild dogs in one enclosure and the two hyenas in another. We moved back toward the “Australia” section (the divisions as to where animals are kept are not quite that precise, but the themes do make for good decorating and displays of habitat information). That’s where we stopped to chat with the lorikeets. These two were sharing an enclosure with a very somber kookaburra and seemed to want to make up for his standoffishness. They flew right up to the mesh in front of us, chirping very conversationally. A few minutes later, when a yellow-crested cockatiel very softly said “Hi,” we felt very welcome. This sensation was not in the least diminished when we joined the parakeets in their free-flight enclosure. The koalas were their usual sleepy selves, and the new wallabies looked as if they were still adjusting to their new quarters. I could go on, animal by animal, but I’ll try and hit the high points. I’m never sure what’s more fun – the new arrivals or seeing old friends looking sleek and healthy. Up on the “Catwalk” we had a chance for both. The three mountain lions were heaped up right next to their viewing window looking – as we heard more than one person exclaim – “just like our cats at home!” The snow leopards, jaguars, and leopards were relaxed and haughty. The lions were less than dignified as they sprawled on their backs, soaking up every ounce of the pale and intermittent spring sunlight. Many of the smaller cats – ocelots, bobcats, and the like – were enjoying hammocks. A new addition to the Catwalk was a binturong or “bear cat” – an Asian animal that really did look like the love child of an amorous bear and a very brave cat. Long-bodied, with shaggy brown-into-black fur, this lady seemed as interested in her viewers as they were in her. The Mexican wolves were either off-display or taking advantage of their dens under the fallen cottonwood tree, but elsewhere we saw giraffes, zebras, ostriches, and many, many more animals than I can possibly list here, including some free-ranging peacocks who very clearly thought they owned the place. We finished by walking out to where we could see Daisy, the baby elephant, and her mother, Rose. To keep this young creature from being overwhelmed by her admirers, the zoo staff has Daisy on display only a limited time each day. 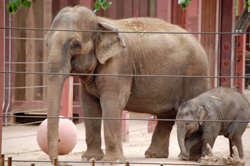 Her enclosure is separated from human contact by the tracks of the (very quiet) zoo rail system. We had a great view from the train platform. I’m not usually much for elephants, but Daisy was so clearly enjoying herself as she threaded between the tree-truck legs of her mother and another elephant that we stood watching them all for quite a long while. I think I’ve been converted! About a quarter of an hour before closing, Jim and I wandered out to our car, a bit footsore but very content. I want to go back to the zoo again before too much time goes by. Daisy will be a little bigger, and I’m pretty sure at least one zebra was pregnant. There’s so much to see and, as with anything alive, the view keeps changing.